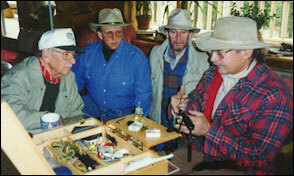 Over the years I’ve had the rare privilege of sitting down with some of the best fly tyers of this era - watching and learning, then imitating their techniques. These sessions were informal, but intensive. They were also invaluable. I watched Cal Bird, Darwin Atkins, Dave Whitlock, Andre Puyans, Bob Quigley, Mike Lawson, Gary LaFontaine, Jack Dennis, and others share their techniques and secrets - the unnoticed ‘little things’ that make a tremendous difference. My tying advanced a quantum leap at every sitting. I was able to adapt and build on what I had learned. Another thing: These sessions were fun. I look forward to a good time, sharing what I’ve learned in a lifetime of tying. 1. Brace your hands while cutting. Brace one hand against the vise, and brace the scissor hand against it. This can be just one finger leaning against the scissor blade as you cut. Makes for precise cuts. One of my favorite quotes is from Rene' Harrop: "A lot of what passes for masterful fly tying is merely judicious barbering." 2. Cement throughout the tying operation. Cement the thread foundation before you wrap a material on the fly when you tie in; cement each time you tie off. Use an applicator jar with a built-in needle. Result: Sturdier flies. The few extra seconds at the vise translates into dramatic increases in fishing time. 3. Set your bobbin tension light - so the thread pulls freely from the bobbin. Finger pressure on the spool can be added when needed. While the bobbin should not fall and flop around out of control because the tension is too loose, tying with too much tension slows your speed and does not allow for the thread control that produces masterful flies. 4. Try to tie a minimum of a dozen flies of a type before switching sizes or fly types. The last four in that dozen will go faster than the first two, and will be better flies, as your hands and eyes and mind get grooved into the process. 5. Count your wraps. If a nine-wrap body crowds everything else too close to the eye, go to eight on the next fly. Counting becomes reflexive after a while, and your flies will reveal a consistency and refinement in their appearance that is difficult to achieve without it. 6. Prepare your materials in advance. For example, after you've tied the first dry fly in a dozen to check the size, select and trim the hackles. Have your hooks pre-counted and ready at hand. I tie with some materials in my lap, some on my bench, and my tools within easy reach according to the sequence in which I use them. Think about these things as you tie, and develop your own system. 7. Select materials that are fly and size specific. For example, the whitetail deer hair I use for a CV wing is radically different from the hair I use for a Sculpin. Substitute freely as you need to, but if you set out to tie a batch of a favorite pattern, get the right stuff. Material selection is one of the most critical - and overlooked - aspects of fly tying. 8. About speed: Don't try to tie real fast. Speed is a natural by-product of repetition and economy of motion. All of the things I've said thus far add up to speed. I'll only add this: Keep your bobbin close to your work. You'll soon be counting three quick thread wraps instead of three wide, ranging, slow loops. The Rite Bobbin (see below) makes this easy, and fast. 9. Tie each fly from beginning to end. I've read articles at various times that suggest "staging" - that is, tying all of the bodies in a bunch, then going back to do the wings, etc. A number of great professional tyers from my generation (we saw commercial domestic tying replaced by quality overseas production) are still real "speed merchants" behind the vise, and none of us stage much of anything. We can all move on to the next step quicker than we can take the hook out of the vise and put it back in again. There are exceptions (I like to trim my Sculpin heads all in a bunch, outdoors, holding the flies downwind in a gentle breeze), but as a general practice, staging slows you down and inhibits tying flies that have continuity. 10. Proportion, proportion, proportion. You've heard it before. It still bears repeating. Pay attention to it in every fly you tie. Please remember that it has as much to do with the amount and texture of material used (finer stuff for smaller flies) as geometrical relationships. And please don't be afraid to alter the standards for proportion found in most fly tying books. Remember that natural insects don't have hook gapes. They have bodies and legs and wings. Go back to the original design and copy that, as you consider the relationship between wing length and body length. Also, consider utility. If you need more than the "allotted" _ of a hook shank for the hackle collar on a caddis or a stone fly, use it! Soon you’ll develop your own style, and tie flies that are more effective, aesthetically pleasing, and satisfying to tie. The Rite bobbin is a tool I wouldn’t be without, now that I’m spoiled. The drag on the Rite bobbin lets me tie with more speed and accuracy than ever before. There are several at my bench, loaded with the various threads I tie with. This is the finest bobbin I have ever used. If you try one, I’m sure you’ll agree with the many tyers who have purchased them over the years who agree - and the price is right. You can order by phone (406) 363-4197 or via our email contact form. Please feel free to ask questions before ordering.